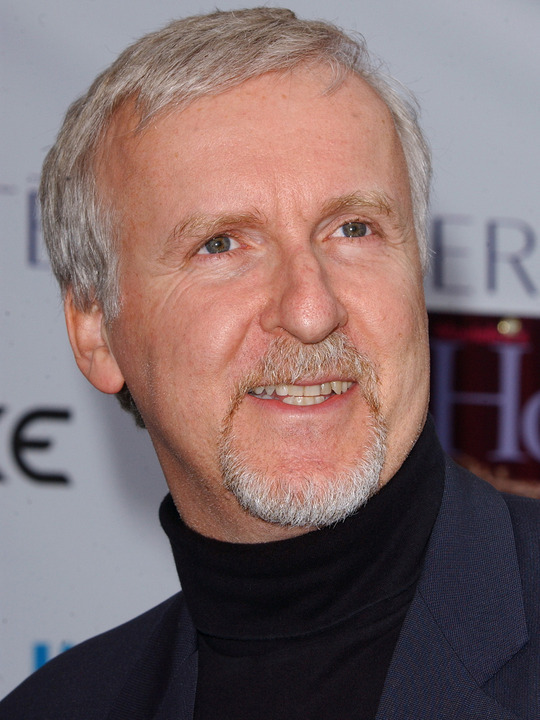 James Francis Cameron is a Canadian film director, film producer, screenwriter, editor, environmentalist and inventor. His writing and directing work includes Piranha II: The Spawning , The Terminator , Aliens , The Abyss , Terminator 2: Judgment Day , True Lies , Titanic , and Dark Angel (2000–2002). In the time between making Titanic and his return to feature films with Avatar , Cameron spent several years creating many documentary films , and also co-developed the digital 3D Fusion Camera System. Described by a biographer as part-scientist and part-artist, Cameron has also contributed to underwater filming and remote vehicle technologies. He has been nominated for six Academy Awards overall, and received half of them, three Oscars for Titanic. In total, Cameron's directorial efforts have grossed approximately US$2 billion in North America and US$6 billion worldwide. Without adjusting for inflation, Cameron's Titanic and Avatar are the two highest-grossing films of all time at $1.84 billion and $2.78 billion respectively. In March 2011 he was named Hollywood's top earner by Vanity Fair, with estimated 2010 earnings of $257 million. While continuing to educate himself in film-making techniques, Cameron started working as a miniature-model maker at Roger Corman Studios. Making rapidly produced, low-budget productions taught Cameron to work efficiently and effectively. He soon found employment as an art director in the sci-fi movie Battle Beyond the Stars . He did special effects work design and direction on John Carpenter's Escape from New York , acted as production designer on Galaxy of Terror , and consulted on the design of Android . Cameron was hired as the special effects director for the sequel of Piranha, entitled Piranha II: The Spawning in 1981. The director left the project and Cameron was hired by Italian producer Assonitis to take over, giving him his first directorial job. He worked with producer Roger Corman. The interior scenes were filmed in Italy while the underwater diving sequences were shot at Grand Cayman Island. The movie was to be produced in Jamaica, but when Cameron arrived at the studio, he discovered that the project was under-financed and that his crew was mainly composed of Italians who spoke no English. Experiencing considerable stress, Cameron had a nightmare about an invincible robot hitman sent from the future to kill him, giving him the idea for The Terminator, which would later catapult his filming career. Cameron has been married five times: to Sharon Williams (1978–1984), Gale Anne Hurd (1985–1989), Kathryn Bigelow (1989–1991), and Linda Hamilton (1997–1999, daughter Josephine born in 1993). Cameron dated Hamilton since 1991, but the two didn't marry until 1997. Cameron and Hamilton separated soon after, and he became a financial success with Titanic; this success resulted in his $50 million divorce payment to Hamilton. He married Suzy Amis in 2000, and they have one son and two daughters. Cameron lives in Malibu, California with his wife. Hurd was the producer of Cameron's The Terminator, Aliens, and The Abyss, and the executive producer of Terminator 2: Judgment Day. Hamilton played the role of Sarah Connor in both Terminator films. Amis played the part of Lizzy Calvert, Rose's granddaughter, in Titanic. Both Cameron and Bigelow were nominated for the Oscar, Golden Globe, and BAFTA Award for Best Director for films released in 2009. Cameron won the Golden Globe, whilst Bigelow won the Oscar and the BAFTA for Best Director, becoming the first woman to win either. Cameron is a member of the NASA Advisory Council and is working on the project to put cameras on an upcoming manned Mars mission. Cameron has also given speeches and raised money for the Mars Society, a non-profit organization lobbying for the colonization of Mars. In June 2010, Cameron met in Washington with the EPA to discuss possible solutions to the 2010 BP oil spill. Later that week at the All Things Digital Conference, he attracted some notoriety when he stated, "Over the last few weeks I've watched...and thinking, 'Those morons don't know what they're doing'." Reportedly, Cameron had offered BP help to plug the oil well, but they declined. The oil spill was eventually stopped using techniques similar to what Cameron recommended. Although Cameron has lived his entire adult life in the United States, he remains a Canadian citizen. Cameron applied for American citizenship but withdrew his application after George W. Bush won the presidential election in 2004. Cameron calls himself "Converted Agnostic", and says "I've sworn off agnosticism, which I now call cowardly atheism". As a child he described the Lord's Prayer as being a 'tribal chant'. Whole or part of the information contained in this card come from the Wikipedia article "James Cameron", licensed under CC-BY-SA full list of contributors here.